A "deeper relationship" with Europe will benefit the UK economy, the governor of the Bank of England said. Mark Carney's comments follow claims by chancellor Philip Hammond that the UK and EU economies will only move "very modestly" apart after Brexit. Mr Carney said that while global growth had accelerated, the UK was suffering a "Brexit effect" in the short term. "The economy is doing not as well as we expected it to prior to the referendum," he told the BBC in Davos. That meant the UK economy is now 1% smaller than the Bank had predicted before the EU vote. 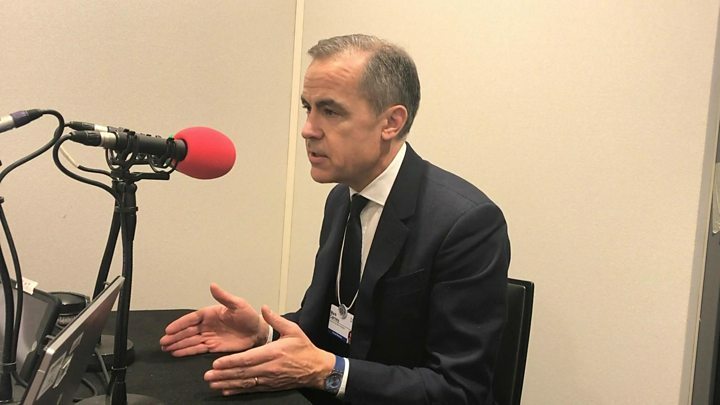 "What it works out to is tens of billions of pounds lower economic activity," Mr Carney told Radio 4's Today programme. "Investment has picked up a bit but it hasn't picked up anyways to the same extent as internationally." However, the governor said that as "greater clarity" about the shape of Brexit emerged this year, there would be a "conscious re-coupling" of the UK economy with the global economy. "The deeper the relationship with Europe, the deeper the relationship with the rest of the world... the better it's going to be over time for the UK economy," he added. Mr Hammond said the EU and UK economies were already "completely interconnected and aligned". Mr Carney also said that companies had cut back on investing in the UK as they waited for more clarity on Brexit. "Investment in advanced economies is growing at double-digit rates, and it is low single digits here," he said. The Bank of England will give updated forecasts for the UK economy in the Bank of England's quarterly Inflation Report on 8 February.